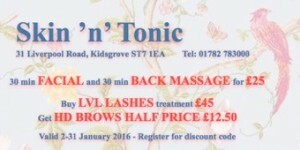 Go Kidsgrove and Skin ‘n’ Tonic have teamed up to offer a fabulous range of discounted treatments and make overs. The offers are shown in the graphic below. To qualify for the offers and receive your discount code, simply sign up to our Go Kidsgrove newsletter using the form below. Once completed you will receive your code by email.